Box with crystal orange colour beads from Petite Glass Beads Collection. May be affected by detergents, oxidation or strong friction. Kit contains: box with beads, weight: 1.6 grams.. Box with opal beads from Petite Glass Beads Collection. Kit contains: box with beads, weight: 1.6 grams.. Box with light blue colour beads from "Petite Glass Beads Collection". Kit contains: box with beads, weight: 1.6 grams.. Box with iris colour beads from "Petite Glass Beads Collection". Kit contains: box with beads, weight: 1.6 grams.. Box with matte, dark orange colour beads from Petite Glass Beads Collection. May be affected by detergents, oxidation or strong friction. 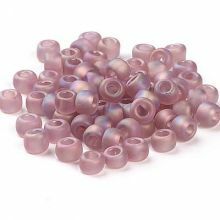 Kit contains: box with beads, weight: 1.6 grams..